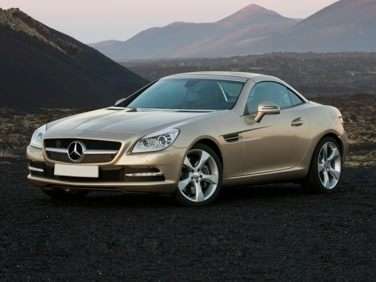 The Mercedes-Benz SLK-Class is a two-door, two-passenger luxury roadster. When it became clear that the SL-Class roadster had evolved into a large, heavier car with a greater focus on luxury than on lightweight, nimble performance, Mercedes-Benz decided to fill that particular hole in their lineup with a new, smaller roadster that could continue the tradition of the SL. Dubbed the SLK-Class, and released in 1997, the vehicle featured one of the first retractable hard tops to be fitted onto a small sports car, an impressive feat given the usually miniscule trunk space offered by this class of automobile. The Mercedes-Benz SLK-Class has just been re-styled in an effort to give new life to the current generation of vehicle, which had its last major design change occur in 2004. The SLK bears a scaled-down version of the same exterior front-end design that can be seen on the Mercedes-McLaren SLR supercar, and the nosey front clip has been somewhat polarizing for buyers, especially when compared to the outgoing model’s sleek appearance. For 2009, the SLK-Class has two standard engine options as well as an AMG-tuned edition covering the full range of performance and price points expected from a Mercedes roadster. The entry-level SLK300 is powered by a 3.0 liter, 228 horsepower V6 that also produces 221 lb-ft of torque. The SLK300 is notable for being one of the few vehicles in the Mercedes-Benz lineup to offer a manual transmission, with buyers being able to choose between either a 6-speed manual or a paddle-shifted 7-speed automatic. Acceleration for the SLK300 to 60 miles per hour is a brisk 6.1 seconds, but for those who want to lop of a little more than half a second from that time, the larger 3.5 liter V6 found in the SLK350 will do the job. This 300 horsepower unit is sadly only available with a 7-speed automatic transmission, but it does get almost identical fuel mileage compared to the SLK3000 – 18 miles per gallon in the city and 26 miles per gallon on the highway. The SLK55 AMG is the best performer of the three, with a 5.5 liter V8 engine making 355 horsepower and accelerating the SLK-Class to 60 miles per hour in less than 5 seconds. A stiffer, sport tuned suspension and more aggressive bodywork also help to set the SLK55 AMG apart from its slower stable mates. Small roadsters are all about fun – at least, that is usually how they are marketed – and the second generation SLK-Class platform is quite capable of providing that in spades. With or without the roof up, the SLK-Class is very much point and shoot in the corners, and the road-holding and braking of the vehicle are excellent. The SLK is in the same class as sports cars such as the Nissan 350Z or the BMW Z4, and the hard top makes it a practical vehicle as well as a toy. The Mercedes-Benz SLK-Class is not an inexpensive vehicle, but it does provide great value for those who wish to combine luxury and performance in a compact package.